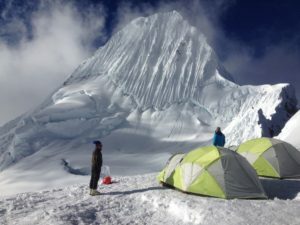 In July we also had two private personal trips in Peru for Alpenglow guides/owners, Adrian Ballinger and Logan Talbott. Logan had a great time in Peru and climbed Alpamayo and Artesonraju with his climbing partner, Eric. In the Cordillera Blanca Adrian, and his girlfriend Emily Harrington, did some sport climbing, alpine climbing, and skiied Tocllaraju. Overall a successful and exciting month! This Saturday we have another trip headed to Bolivia to climb three peaks: Pequeño Alpamayo (17,482′ / 5329m), Huayna Potosi (19,975′ / 6088m), and Illimani (21,125′ / 6439m) over two weeks from July 29- August 13. For more information on our Peru and Bolivia expeditions, or any of our other international expeditions check out our website. For any questions call our office at 877-873-5376. We hope to climb with you soon!